Choose 1 or more color choice here. 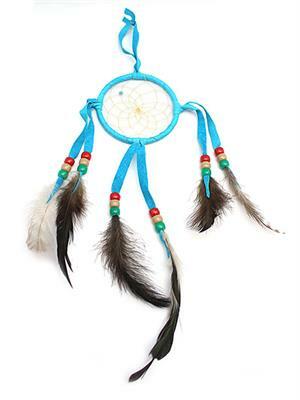 Navajo crafted 3" leather dream catcher. It has beads and feathers for decoration. Colors of leather are assorted and feathers and beads will vary. Crafted by several different artisans. They will vary from picture as far as the dangle feathers but they are the 3" dreamcatcher. Colors available are light green, light pink, forest green, black or purple. Choose color when ordering or let us choose for you. None available in turquoise blue like pictured.